‘TS TET Result 2016’ Telangana TET Exam Scorecard at tstet.cgg.gov.in: The 2016 TS TET exam result are going to be released by the Department of School Education, Hyderabad. The Telangana State Teacher Eligibility Test (TS TET 2016) results are going to be declared on the website that we provided here below. 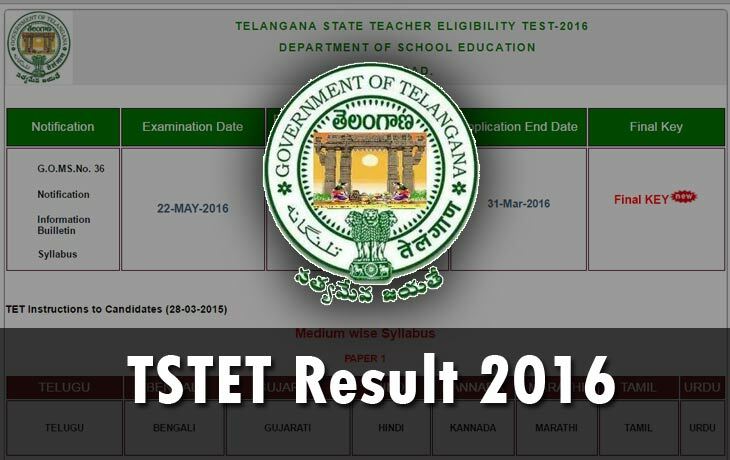 This 2016 TSTET examination was conducted by Telangana’s State School Education Department. The Telangana Teacher Eligibility Test was held on 01 May 2016, and the Answer key has been available on the same website which we provided below. The Education Board presented their Final Answer Key (TSTET 2016 Final Answer Key) by Medium wise. The Final Answer key of TSTET 2016 has updated with the Medium wise in the concerned website. The Mediums are for Paper I was Telugu, Urdu, Hindi, Kannada, Marathi, Tamil, Bengali, and Gujarati. The Paper II Mediums for the Mathematics and Science was Telugu, Urdu, Hindi, Kannada, Marathi, Tamil, and Sanskrit. The Paper II Mediums for the Social Studies was Telugu, Urdu, Hindi, Kannada, Marathi, Tamil, and Sanskrit. Click the above official website link. Click the link which stating the TSTET 2016 result. Enter the complete required details such as registration number and DOB. The TSTET result will appear on the screen. Download the PDF and take a print-out of the result for your future purpose. The TS TET 2016 exams have consisted with the two paper. Whereas the candidates who are all intend to become teachers of Class 1 to 5 have attended Paper I., And the candidates who are all like to teach the classes from 6 to 8 have attended Paper II. Stay tuned for the More Updates and News about the TSTET and other exam results updates.